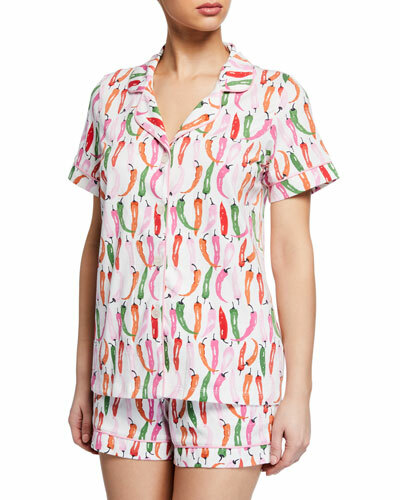 Looking for comfortable and stylish sleepwear for a good night’s sleep? 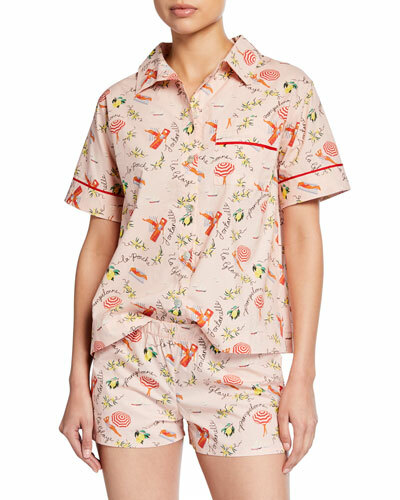 Explore Neiman Marcus for an exquisite collection of women’s sleepshirts, pajamas, and more in vibrant hues and luxurious fits. Our sleepwear for women is made using high-quality fabrics in classic designs. Whether you want to lounge around in a caftan or just sleep in a cami and shorts, we have the sleepwear to suit your needs. The robes in our collection come in comfortable cotton to subtle silk. If you are preparing for a steam bath, choose from lace-trim, terry-knit paneled, or other trendy sleepwear fabrics. You can pick from our lounge and sleepwear collection by designer name, color, size, and more for convenience. 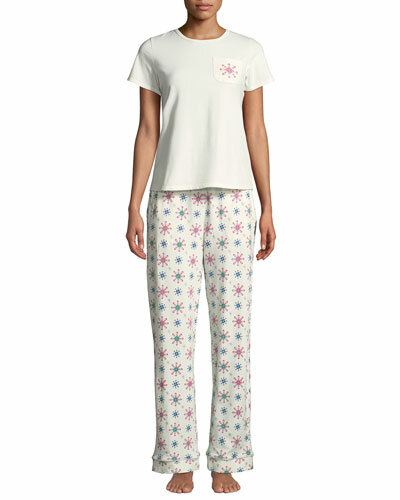 Shop Neiman Marcus’ elite collection of sleepwear and lounge pieces in various styles and designs. Derek Rose "Carla" shortie pajama set. 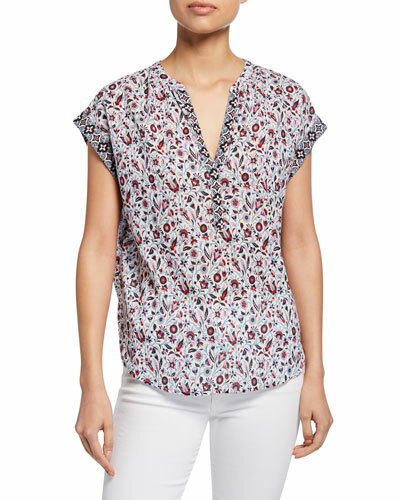 Rounded, notched collar; button front. Short sleeves. Chest patch pocket. Includes matching lounge shorts with self-fabric drawstring. Slimmer fit. Micro modal/spandex. Imported. Model's measurements: Height 5'10"/177cm, bust 33"/84cm, waist 25.6"/65.2cm, hips 35.8"/91cm, dress size US 2-4/FR 34-36. Desmond & Dempsey "Deia" pajama set. Notched lapel; mother of pearl button front. Long sleeves with banded cuffs. Front patch pocket. Vented hem. Includes wide-leg long pants. Drawstring waist. Cotton. Imported. Model's measurements: Height 5'10"/177cm, bust 33"/84cm, waist 25.6"/65.2cm, hips 35.8"/91cm, dress size US 2-4/FR 34-36. 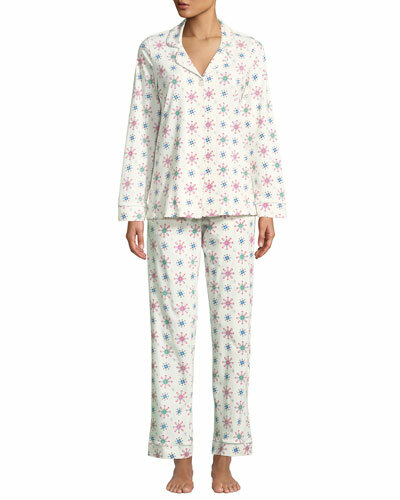 Desmond & Dempsey pajama set in floral print voile. Notched lapel; button front. Long sleeves with banded cuffs. Front patch pocket. Vented hem. 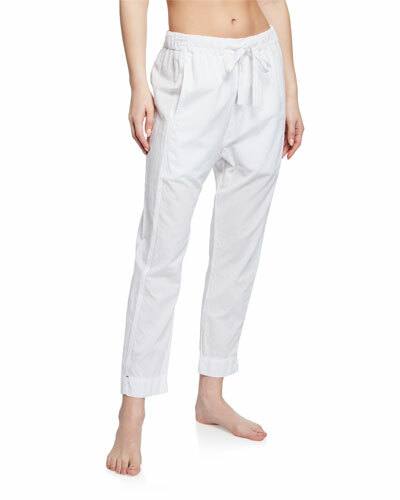 Includes wide-leg long pants. Drawstring waist. Cotton. Imported. Model's measurements: Height 5'10"/177cm, bust 33"/84cm, waist 25.6"/65.2cm, hips 35.8"/91cm, dress size US 2-4/FR 34-36.